The analysis of physical surfaces and fields is a topic that is best explored using tangible examples. To this end, this part of the Guide uses a number of common datasets to illustrate the various forms of analysis that may be readily carried out. Our first dataset comprises eight sub-tiles from the GB Ordnance Survey 10m digital elevation model (DEM), taken from tiles TQ81, TQ82, TQ91 and TQ92. Detailed analysis is conducted on one of the tiles, TQ81NE. Each DEM tile contains approximately 250,000 cells, and the mosaic-ed (combined) 8-tile region is thus roughly 2 million cells. A 3D visualization of tile TQ81NE is shown in Figure 6‑1. This was created in Surfer. 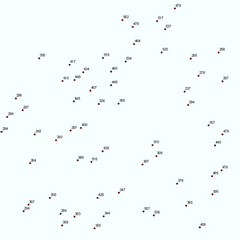 Comments on artifacts associated with this dataset appear later in this chapter. 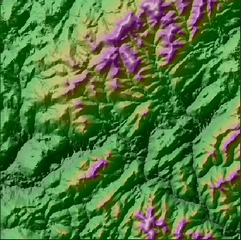 The data files referred to may be obtained from the Ordnance Survey directly or via the EDINA data download service (for academic use only — see the Web links: “Selected national and international data and information sources” Section at the end of this Guide for details). Each main tile (e.g. TQ81) is made up of 4 sub-tiles (in this example TQ81NE, NW, SE and SW). These sub-tiles are 5000mx5000m, and the TQ81NE tile has a modest maximum height of around 70m. The tiles consist of a number of ridges, separated by relatively broad very flat valleys, and border on the English Channel. 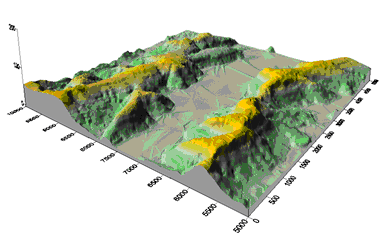 A separate dataset representing a much more rugged landscape is also used, both in the present chapter (notably in the section covering interpolation methods) and elsewhere in this Guide. This covers part of the Pentland Hills area to the south of Edinburgh in Scotland. The principal OS tile used in this case is NT04. It has already been used in our discussion of Delaunay triangulations and Voronoi polygons (Section 4.2.14, Tessellations and triangulations).